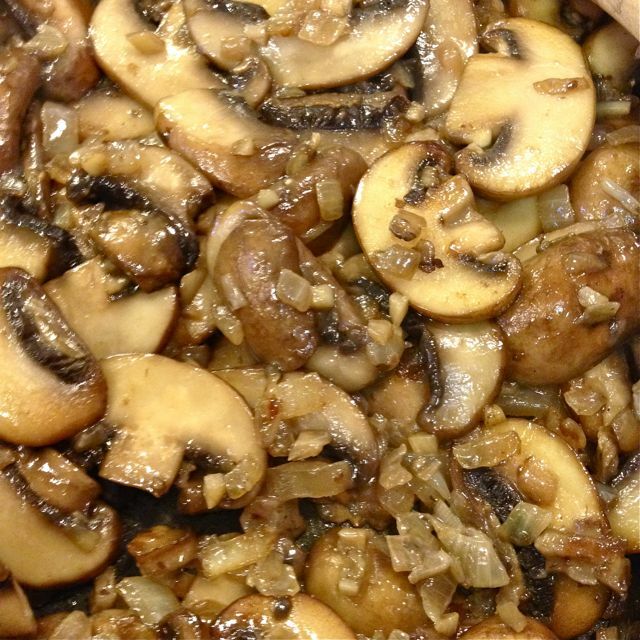 Here it is the beginning of spring and I’m baking a mushroom risotto. It’s still cold out, although if the sun’s shining while working out in the garden it’s wonderful to feel the heat! I think that as long as the weather still has us cooking indoors, we can still enjoy a hearty repast. This dish can be served as a main course, with a few vegetables on the side, or a big crunchy salad. It also serves well accompanying pork or beef. I try to serve meat as a component of the meal, not the star attraction. I think it keeps meals more balanced. After you have prepared your ingredients, place a 2 quart, 2½” deep ovenproof dish in the oven to warm while you cook the ingredients. 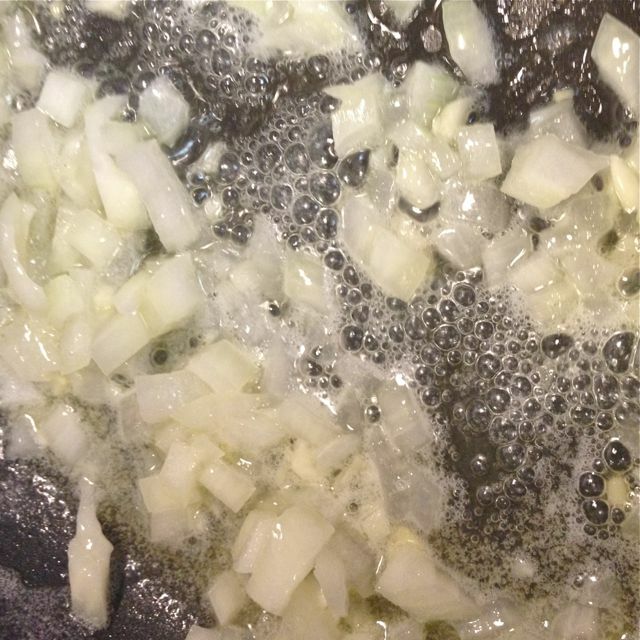 Add in the chopped onion and garlic, and sauté until transparent. 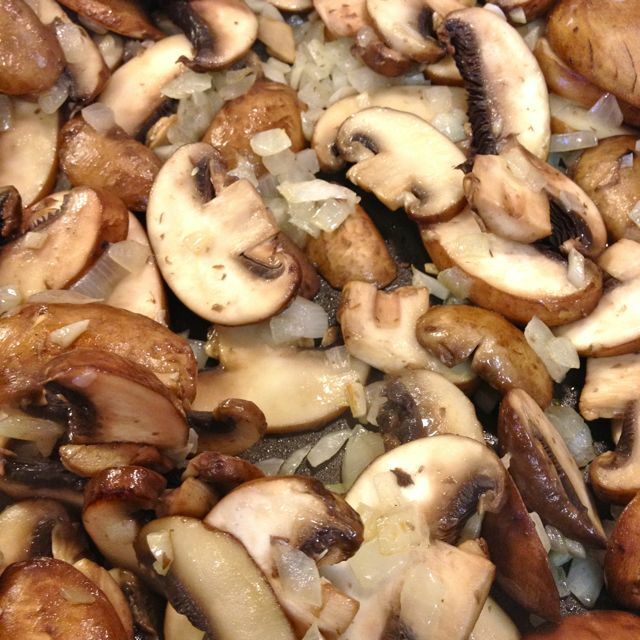 Add in the sliced mushrooms, and continue to cook, stirring occasionally for another 10–12 minutes Add in the rice, and stir for 1 minute. Add in the stock and sherry. 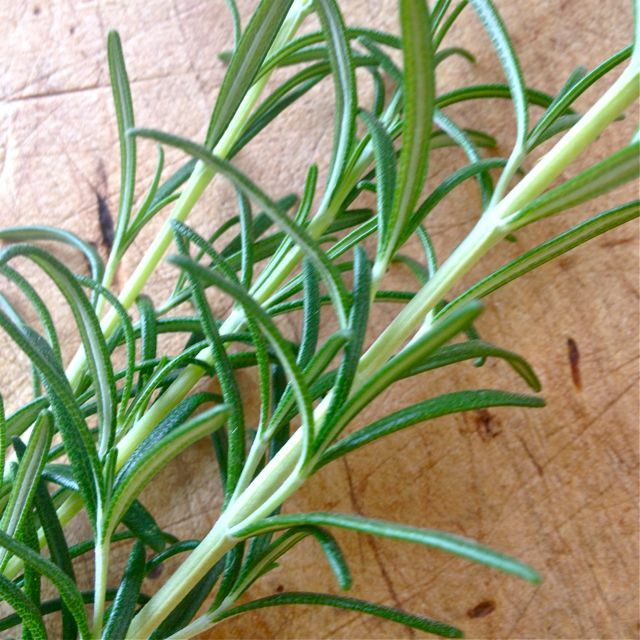 Add in the sprig of rosemary. Increase the heat, and when just starting to bubble, carefully transfer the mixture to the preheated baking dish (remove the dish from the oven to the stovetop for the transfer). 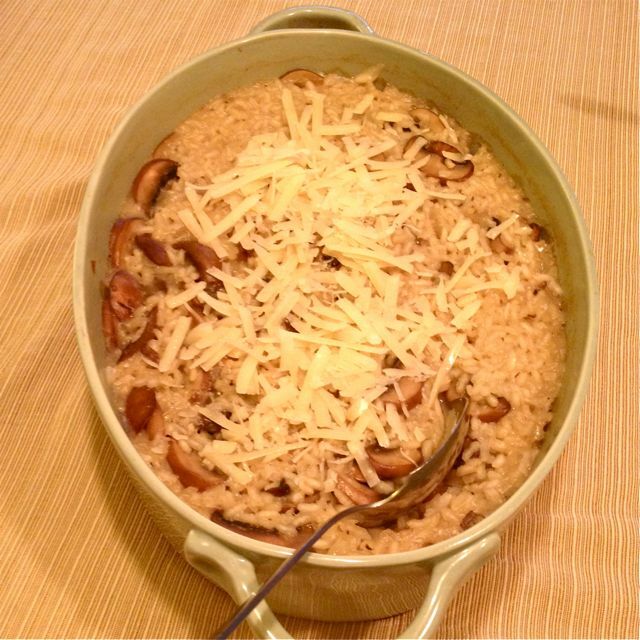 Bake the risotto on the middle shelf of the oven for 15 minutes. Stir in the finely grated ¼ c of Parmesan, and continue to bake the risotto for 20 minutes more. 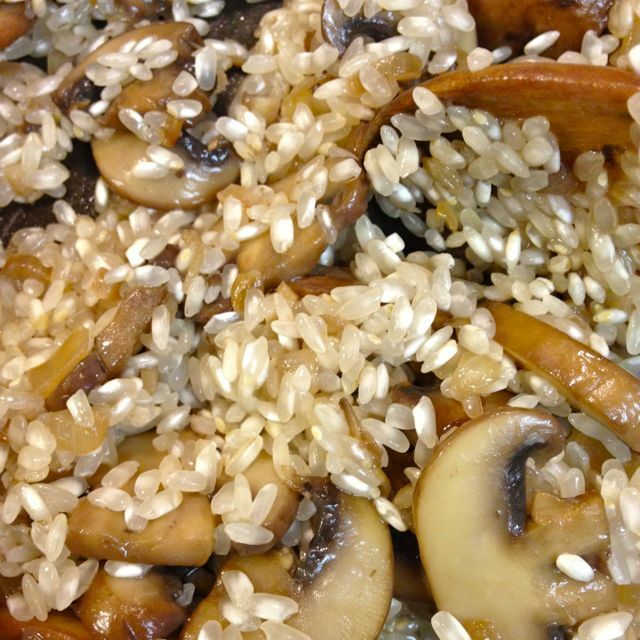 Test the rice; it should be tender and completely cooked. If there’s any crunch, give it another 5 minutes. 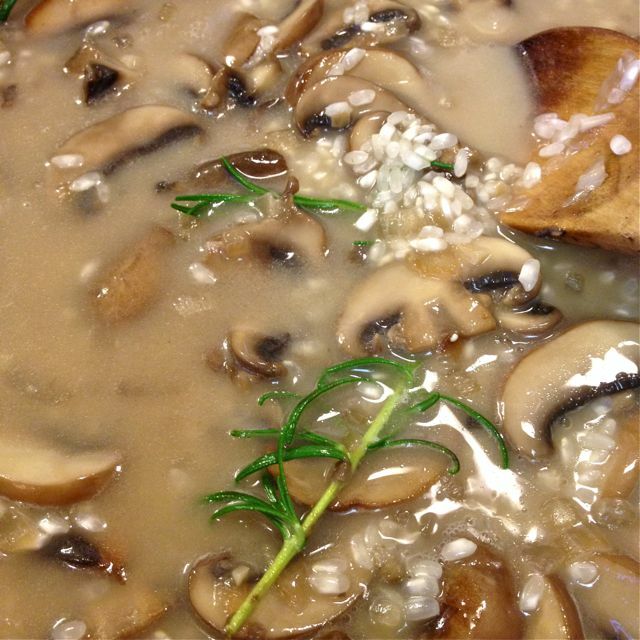 As soon as the risotto comes out of the oven, stir it well and remove the rosemary twig. Season it with more salt and pepper to taste if desired. Sprinkle with the remaining Parmesan, and serve.